The following medals, layered in pure silver, are the first ever commemorative medals to pay tribute to the iconic buildings in Dublin that played a vital part in Ireland’s struggle for independence. When you order your limited edition gold layered Michael Collins 80th Anniversary Medal for just €19.95 (usually €59.95), you qualify to receive the remaining five medals, without any risk or obligation. These will be delivered to you in convenient monthly intervals for just €29.95 each (plus €3.95 P&P), always on approval. You may stop collecting at any time. Normally €39.95 each, that’s a combined saving of €90 on the complete set when you order today. All purchase are protected by The Dublin Mint Office 14 day ‘no quibble’ returns guarantee. 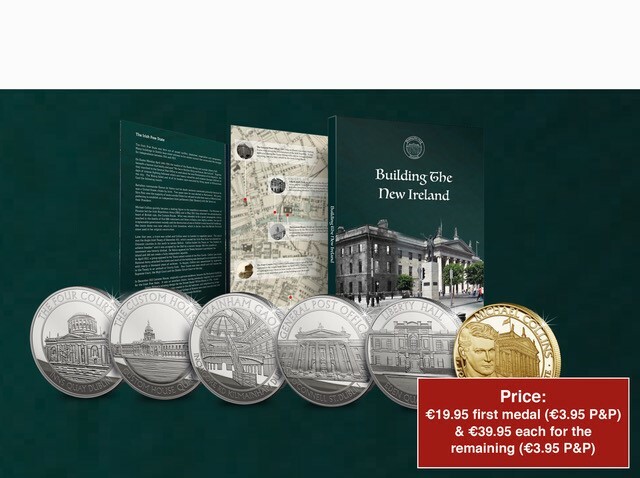 The Michael Collins Commemorative Medal is supplied in a FREE Premium Presentation Pack (normally €4.95), together with a Certificate of Authenticity that guarantees the medal's provenance for the future. Due to the strict limitation, only one medal per household is allowed. Coins are allocated on a first come first serve basis. A total saving of €90.00 across the set!